Whether working on an international project for a Fortune 500 company or organizing a family reunion, you need effective project management to ensure timely and efficient completion of projects. 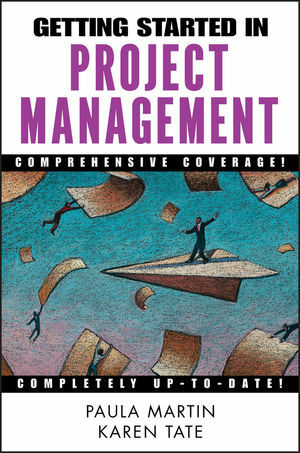 This helpful guide offers explanations of everything needed to get started in project management including: how to initiate a project and lead the project team, how to structure the project and plan for resources, how to monitor and track the plan, and how to close out the project. Packed with practical advice, this book includes tips to increase success, reveals common pitfalls to avoid, and presents case studies to show and why project management actually works. Paula Martin (Torrington, CT) is the CEO of Martin Tate, a management consulting and training company. She works with project teams to help them improve performance and has been a consultant on issues related to improving organization performance for over ten years. Karen Tate (Cincinnati, OH) is the President of MartinTate and is a Project Management Professional. She has over twenty years of project management experience and teaches project management to teams in organizations around the world. PAULA MARTIN is the CEO of MartinTate, a management consulting and training company. She is the author or coauthor of six books. She works with project teams to help them improve performance and has been a consultant on issues related to improving organization performance for over ten years. KAREN TATE, PMP, is the President of MartinTate and is a project management professional. She has over twenty years of project management experience and teaches project management to teams in organizations around the world. Chapter 2. Initiating a Project. Chapter 3. Leading the Project Team. Chapter 4. Kicking Off the Project. Chapter 5. Planning the Scope. Chapter 6. Organizing the Project. Chapter 8. Developing a Schedule. Chapter 9. Developing a Budget. Chapter 10. Assembling the Project Plan. Chapter 12. Executing the Plan. Chapter 13. Closing Out the Project. Appendix A: Project Leadership Self-Assessment. Appendix C: Sample Team Contract. Appendix D: MT Problem Solving Methodology. Appendix E: Project Management Self-Assessment.